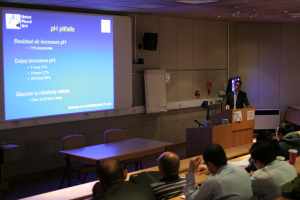 The UK Thoracoscopy Course is a postgraduate course run annually on one day and is now in its 16th year. It has been designed to educate both respiratory medicine consultants and registrars in the basics of thoracoscopy. It complements the pleural diseases course, but is run by the team at King’s Mill Hospital. The course has a strong hands-on practical component. 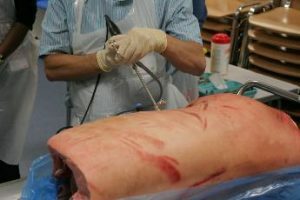 Delegates will be able to learn and practice thoracoscopic techniques. The course is approved through the Royal College of Physicians (London) for 6 CPD points (114840). Dr Cox is the lead physician in lung cancer at King’s Mill Hospital and regularly performs medical thoracosopy as part of this service. He is in the process of developing a “one stop” service for the management of pleural effusions that includes early diagnosis with medical thoracoscopy and the therapeutic benefits of fluid drainage and pleurodesis. Dr Downer is a respiratory consultant with an interest in pleural disease and education. She has undergone training in thoracoscopy and is part of the BTS working party that has published guidelines on medical thoracoscopy. Most recently she has completed a M. Med Sci in medical education that included a dissertation on how to teach and assess competency in postgraduate clinical procedures. Dr Roberts is a respiratory physician with interests in lung cancer and pleural disease and regularly performs thoracoscopy. He was the first author on the recent BTS Guideline on the Management of a Malignant Pleural Effusion and also runs a pleural ultrasound course for respiratory trainees. Dr Rahman is a consultant respiratory physician and previously worked as the pleural disease research fellow in Oxford. He has numerous publications in the field of pleural disease and was a lead researcher in the MIST 2 trial.